Dungeon Lords now at Canton Games! 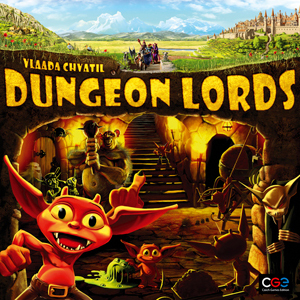 Finally, at long long last, we have the long awaited and highly anticipated release of the board game Dungeon Lords! I played a prototype version of this back in April and I’ve been holding my breath for its release ever since. If you’ve ever played the old PC game Dungeon Keeper 2, then you know exactly what you’re about to get into. In this game, there’s the standard group of adventurers – some fighters, clerics, and a thief or two, and they’re delving into the dungeon to kill the bad guys and win the loot. But guess what? You’re the bad guy. These chumps are coming into your perfect little dungeon with the intent to rip it all out. You have to go hire some monsters, set a few traps, and build some evil rooms to protect yourself, before you find your underground paradise completely ruined. Look! Look! It's Dungeon Lords! And look how cute this imp is! You wouldn’t want some big mean paladin coming in and smashing up his bunk bed, would you? In fact, I declare a caption contest! Post in the comments the funniest thing you can imagine this little imp saying. And keep it clean – this is a family site (other entries can be emailed to me). This entry was posted on Thursday, January 21st, 2010 at 7:37 PM and is filed under Uncategorized. You can follow any responses to this entry through the RSS 2.0 feed. Both comments and pings are currently closed. One Response to Dungeon Lords now at Canton Games!